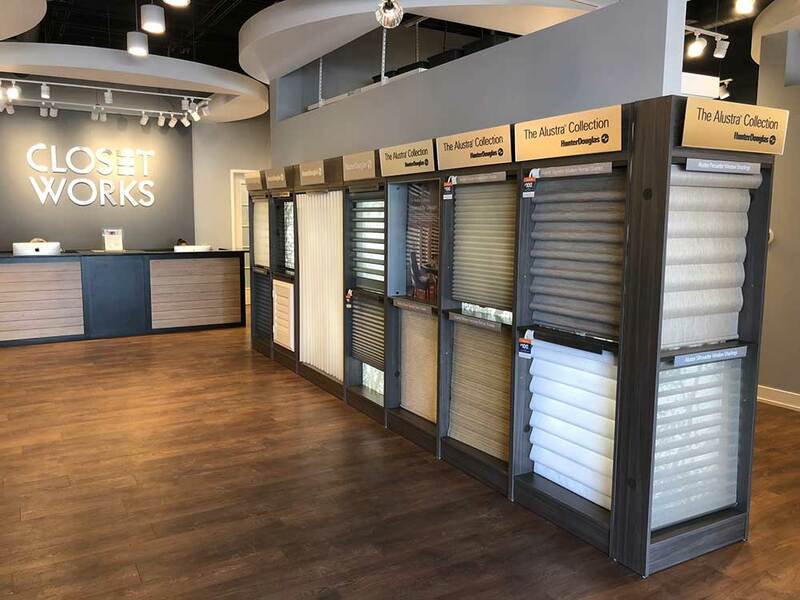 When you purchase from Closet Works, your beautiful new shades, blinds and curtains also have the potential to operate remotely using a motorized operating system. The power system appropriate for your custom window covering depends mostly on the type of product you purchase, however, all systems are built on the most innovative technology in the industry. 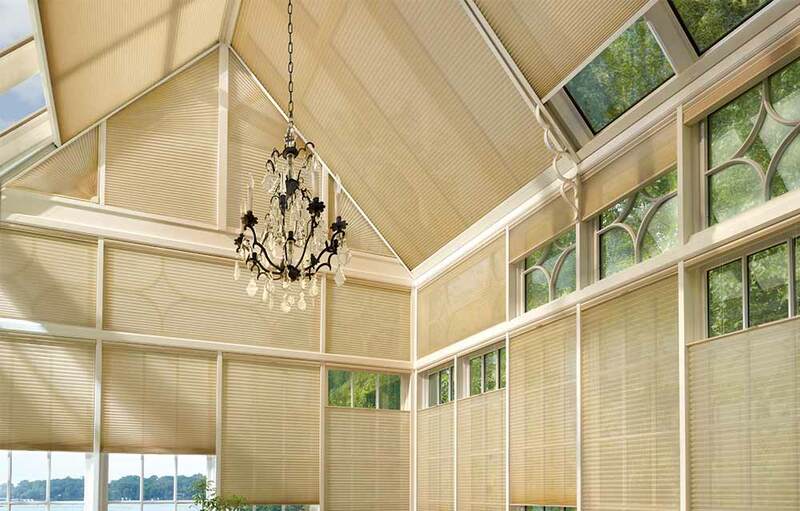 Motorization is one of the operating system options for most Hunter Douglas shades, sheers, panels and vertical or horizontal blinds. Plantation shutters are not yet available with motorization due to the heavier weight of this type of window treatment. Most Hunter Douglas motorizations are battery powered, so they are easy to install, operate and maintain. The battery pack is hidden behind the headrail, so there is nothing to mar the beauty of your windows. Furthermore, the simple cord-free operation is aesthetically pleasing and safer for homes with children and pets. Closet Works is proud to offer the state-of-the-art PowerView® Motorization system from Hunter Douglas. Perfect lighting, energy efficiency, everyday convenience — it's all delivered automatically with PowerView®. PowerView® smart controls work with your home's WiFi network. It uses a remote control to adjust window treatments at the touch of a button. Using your PowerView® App, you can quickly create customized Scenes that control all the motorized window treatments in your home, operating together or in any combination you desire. Then, just schedule those Scenes to automatically move your shades to your preferred positions. You can use it to move your shades according to the sun's daily patterns to reduce solar heat gain in summer and solar heat loss in winter. You can also adjust your shades for added security while you're away via the RemoteConnect™ feature on your smartphone or tablet. Whether you want to move the shades up or down, tilt or traverse them, PowerView® Motorization gives you precise and convenient control of your Hunter Douglas window treatments. PowerView® Hub: The simple and elegantly designed Hub connects wirelessly to your home WiFi network. It's the central point of control for all your home's PowerView® window treatments, storing your settings and activating your Scenes. Pebble® and Surface Remote: The is the basic remote control for PowerView® Automation. Available in many colors, the stylish handheld Pebble Remote or the wall-mounted Surface Remote puts direct adjustment at your fingertips. Operate individual or groups of shades with the touch of a button. PowerView® App: Send your window treatments to a specific position via the swipe of your finger or simple voice commands! Compatible with both Apple® and Android™ tablet or mobile devices, the App allows you to designate and customize a collection of Rooms and Scenes. The scheduling feature allows operation whether you are at home or away. Pebble® and Surface Scene Controller: When your tablet or smartphone isn't handy, the Scene Controller works seemlessly with the PowerView® Hub and App to trigger the Scenes you've created, adding even more convenient control. PowerView® Repeater: The Repeater is a small signal enhancer that discreetly plugs into almost any outlet to extend signal range and carry command throughout your home. It also provides customized lighting day and night via its illumination features. Operating your PowerView® Shades is a whole lot easier when you use voice commands. Powerview® is compatible with the following voice activation systems. SIRI: PowerView® Shades can be controlled using the Apple Home app and Siri. Use Siri on your iPhone, iPad, or HomePod to operate individual PowerView® Shades or Scenes hands-free. Amazon Alexa: Voice activate your PowerView® Scenes using Amazon Alexa. Google Assistant: Powered by Google Home, the Google Assistant makes it easy to activate your PowerView® Scenes and control your shades with your voice. The PowerView Hub integrates PowerView® features with some of the most popular systems on the market. Each home automation control system has a unique path to integration. Reference the specific usage guidelines and requirements to integrate PowerView® with compatible home automation systems. Please download drivers for these SMART HOME systems from the Hunter Douglas website. Amazon Alexa: PowerView® Motorization with Amazon Alexa allows you to activate your PowerView® Scenes. Just Ask Alexa to "Turn On Good Morning," or "Turn On Dinner Party," and activate your Scenes hands-free. Please note: A PowerView Hub, Gen 2, is required to enable the PowerView® Skill in the Amazon Alexa App. You can still connect PowerView with Amazon Alexa through IFTTT. Apple Home Kit: After installing your PowerView® system, enable HomeKit in a few simple steps directly from the PowerView® App. Once enabled, PowerView® Shades can be controlled using the Apple Home app and Siri with your other HomeKit enabled accessories from your iPhone, iPad, Apple Watch, Mac, and HomePod. Please note: A PowerView® Hub (Gen 2), updated to the latest firmware, is required to enable HomeKit. iOS 10.0 or later is recommended. Google Assistant: Powered by Google Home, the Google Assistant makes it easy to activate your PowerView® Scenes and control your shades with your voice. Google Home can distinguish your voice from others in your home for a more personalized experience and understands your voice commands. Simply say “Ok Google, turn on Good Night Shades” or “Ok Google, activate I’m Home" to get hands-free help for all the PowerView® Motorized shades in your home. NEST: Your motorized window treatments can automatically adjust themselves when your Nest Learning Thermostat senses you are away, or when your local utility grid is nearing its maximum load. IFTTT: PowerView Motorization works with IFTTT so you can create a smart home with just a few swipes and clicks. Logitech® Harmony Home: Use the Harmony Home universal remote control or Harmony App to control PowerView Motorization window treatments. Control4®: Control4 integrators can download the PowerView driver for the proprietary Composer software. Universal Remote Control (URC®): PowerView is compatible with URC's Total Control System. ELAN® Home Systems: Homeowners can control PowerView Motorization through a simple, intuitive interface on any device — remote, touchpad, touchscreen, iPhone, iPad or PC, from anywhere in the home or anywhere in the world. Requires download of PowerView driver. Savant® Systems: Savant integrators can find the PowerView driver for the Savant experience in the Blueprint software database. Remote Technologies Incorporated (RTI): RTI integrators can download the PowerView driver for the Integration Designer software. Crestron®: Crestron integrators can download the PowerView driver for the proprietary SIMPL software. Simple and easy to use, SoftTouch™ Motorization is a battery-powered system with wand-controlled operation. Gently pull down on the wand to lower shades and push up to raise them. Gain convenience and effortless operation at the touch of a button with the motorized operating system for vertical blinds. SkyLift™ skylight system is specifically designed for very large, hard-to-reach, overhead windows. The SkyLift™ system integrates with the PowerView® Motorization for hands free operation.